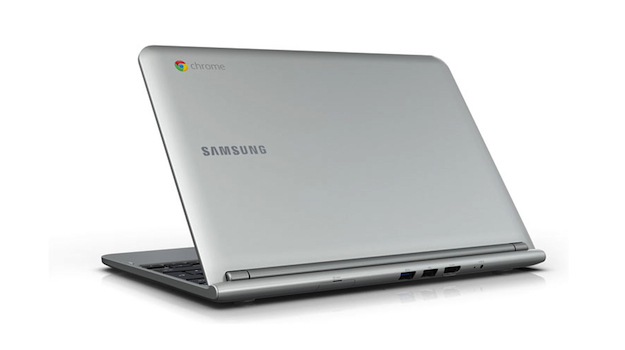 Google has once again collaborated with Samsung to release a laptop with Chrome OS installed. The new model is simply called Chromebook, and is smaller and lighter than the Chromebook 550. It also marks a departure from Intel’s chips, as it’s based on ARM architecture instead. The new Chromebook has an 11.6-inch screen, smaller than previous models, but with a higher (and more traditional) 1368 x 768 pixel resolution. The Celeron processor has been removed and Samsung has installed its own dual-core Exynos 5 Dual chip. This is exciting for several reasons. Samsung’s Exynos 5 Dual was the first chip to use ARM’s Cortex A15 architecture — the same as Qualcomm’s quad-core Snapdragon S4 Pro — and the Chromebook marks its first appearance after being announced in August. It’s also expected to appear in Samsung ’s next generation tablets and although no clock speed is mentioned for the Chromebook, the chip can run at up to 1.7GHz. Samsung and Google’s move to ARM is also good news for our wallets, and the Chromebook has been priced at a very competitive $249 in the US and £229 (if purchased online) in the UK. For this you get a 16GB SSD that provides a 7-second boot up time, 2GB of RAM, a memory card reader, a pair of USB ports, an HDMI-out, Wi-Fi, a VGA camera, Bluetooth 3.0 and a battery that promises more than 6 hours of use before needing a recharge. The chassis weighs 2.5lbs, or 1.1kg, and measures 20mm thick. As the whole point of the Chrome OS is to work in the cloud, Google will make up for the pathetic 16GB of onboard storage space by providing a complimentary 100GB chunk of Google Drive space. The small print points out that this is only valid for 2 years, after which time it’ll revert back to standard and you’ll have to pay. So, the price is good and the spec is interesting, and to help introduce buyers to Chrome OS, Google will promote the new laptop in stores through special “Chrome Zones.” However, with the impending introduction of Windows 8 and all its associated hardware, will the Chromebook get a look in, regardless of its low price? The new Chromebook is available as a pre-order from Best Buy, Amazon, TigerDirect.com and Newegg.com, or from PC World in the UK right now. According to the latter, it’ll be released on October 19.